In his new book, The End of Time, David Horowitz reveals himself with an intimate immediacy that comes through only occasionally in most of his other work. Here, he writes about his father and how their relationship determined the course of his early life, both having followed the radical dream of re-making the world through communism. He writes about his wife, April, and her redeeming love for him in his later and more disillusioned years. He even writes about Mohammed Atta and contemplates Atta’s faith in the idea of the necessity for destruction in order that there be redemption -– an idea that inspires and motivates radicals of all stripes. Mainly, however, he writes about the experience of facing his own mortality and of his struggle with cancer, which, thankfully, now appears to be in remission. Like me, Mr. Horowitz was raised in an atheist family. His father told him at an early age the same thing my grandfather told me, “We begin to die the day we are born.” Both older men thus transmitted their own feelings of fear and helplessness, in the face of what seemed to be a pitiless universe, to the small and vulnerable children we were then. It was like being thrown into the deep end of human thought; left to swim if we could, or to sink in despair at the thought of our extinction at the end of our own brief time, just as they did. Spiritual perception is always difficult to explain. Mr. Horowitz seems a little ill at ease in this area, for he leaves it quickly. Like trying to explain the color red, for example, we cannot actually know for certain that any other person experiences red the same way we do. Those who have experienced red know it, and for those who have not experienced it, red can never really be explained. Horowitz quotes liberally from Blaise Pascal, seeing in the 17th century mathematician a kindred spirit, one whose head was unsure about God, but whose heart held more certainty: “The heart has its reasons which reason does not know.” And as Mr. Horowitz, in his own inimitable fashion, contemplates the great gulf between faith and reason, he makes many interesting observations about life, truth, love and growing older. But in the end, he seems to draw back from making that faith-leap of the heart, and instead settles back into the more familiar state of mental agnosticism. The saving faith that leads to certainty of eternal life eludes him: “one moment I’ll be here and the next I’ll be gone” is how this memoir ends. Fortunately for the rest of us, however, it seems Mr. Horowitz has many more years in which to continue his quest, to grow in the spirit, and to share the fruits of that growth with us in future volumes. Always a loner, Horowitz reveals his longing for home and a feeling of belonging in the universe. The old questions: why was I born, what will happen when I die, what is the meaning of my life; all these are contemplated with his usual unflinching eye. Eventually, he allows himself to be grateful for existence itself and for his time of experience, the pain and the joy, the defeats and the triumphs — all of it. This is the mark of a mature soul, but one whose spiritual journey is still beginning. This one paragraph goes a long way toward explaining the new nexus between the radical left and Islamism. A One World Islamic System is the ultimate goal embodying the world’s redemption, and with it, the end of history; therefore, all means are justified to that end. In this, communism and Islam are identical, while the social movements of Gandhi and Martin Luther King are their antipode. To both of these great men, the means were everything. In Islamic thought, as in communism, the denial of the individual and the elevation of the collective permeates all reasoning. The greatest “good” in Islam is the complete submergence of the individual within the Islamic system. Individual questioning of the system is discouraged, to say the least. The call for “social justice” in Islam is actually a call for the artificial elevation of the Muslim over the non-Muslim, just as an identical call from communism lead to the elevation of the “worker” over the “non-worker.” Both goals arise from the false sense of the superiority of one group over another. Bloodshed and misery are the identical results of the implementation of both. Perhaps this explains why Muslim peoples, condemned to a parasitic existence by Islam, hate that which they can never hope to produce on their own, under the Islamic system: a freely innovative and truly tolerant society. The Islamic system instead continually stifles its best and gives free reign to its worst. But, if the worst should continually overcome the best everywhere, what becomes of our hope? What becomes of our world, and our own vision for a future of civilization and progress for our children? How many times throughout history has the failure to accept basic reality been the cause or “endless human grief”? It is interesting to note that the Hebrew prophets, stretching backwards in time from Jesus to Isaiah, all sacrificed themselves for truth and justice. Muhammad, Stalin and Mao, on the other hand, sacrificed everybody else. As we confront Islamists and their fellow travelers with this reasoning, we should remember that the choice between Islam and reason was made long ago, and remember: it was Islam that won then. The question before us now is, will Islam win against reason today? Let us hope that with valiant truth seekers like David Horowitz in our corner, the light of reason will prevail and go on to eventually triumph in the end. For truly, there is no “end of history” as the Islamists and Communists would have it. 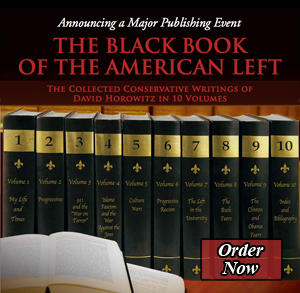 And if I could speak heart to heart with David Horowitz, I would tell him what I know to be true: there is no end of personality, no extinction in the blackness of death. Indeed, there is no “end of time;” rather, eternity gently beckons. Rebecca Bynum is news editor of Jihad Watch. Rebecca Bynum is publisher and senior editor of New English Review.